Abe Cohen Plumbing and Heating Inc. is who you need to call for a residential instant-hot water dispenser in Ahuntsic, Baie D'Urfe, Beaconsfield, Bord du Lac, Cote Saint-Luc, Cote St-Luc, Dollard des Ormeaux, Dorval, Downtown, Hampstead, Ile Bizard, Lachine, Lacey Green, Lakeshore, LaSalle, Laval, Mile End, Montreal West, NDG, Nouveaux St. Laurent, Nun's Island, Old Montreal, Outremont, Pierrefonds, Plateau, Pointe Claire, Pointe St. Charles, Roxboro, Ste-Genevieve, St. Henri, Town of Mount Royal, Verdun, Ville St. Laurent, West Island, Westpark, Westmount. The purpose of an "instant hot" faucet in a kitchen is to deliver 190-degree hot water for immediate use (typically for beverages and cooking). Optional filters for an instant-hot system make for better-tasting, cleaner water with fewer impurities, sediment, and chlorine, but with the minerals found naturally in water still intact. The "instant-hot" water is heated within close range of the faucet. 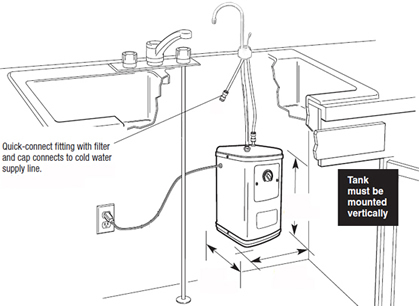 The entire installation (water heater and filter) fits under the counter and sink and delivers instant near-boiling water that is hot enough to make coffee or tea immediately. Call us to arrange for us to provide and to install an instant-hot water dispenser. Installation is quick and leaves no mess. At Abe Cohen Plumbing and Heating Inc., we are a three-generation family business with more than 50 years in the plumbing trade. We consider our customers to be family and friends in a long-term relationship with us. We have the experience, expertise, tools, and equipment to repair or replace instant-hot water dispensers in the greater Montreal area. We are respectful, clean, and professional. We are certified and active members of CMMTQ (Corporation des maîtres mécaniciens en tuyauterie du Québec), ACQ (Association de la Construction du Québec), and certified partners of Gaz Métro for natural gas piping and installations.